Since the end of the Cold War, the United States has been a significant contributor to humanitarian assistance/disaster relief (HADR) in Asia. The geographic region known as the Ring of Fire, which stretches from Christchurch, New Zealand up to the Bering Strait, down the Pacific Coast of the United States, and to the southern tip of Chile is disproportionately prone to natural disasters. The Southeast Asia region of the Ring, in particular, is beleaguered annually by typhoons, volcanoes, earthquakes, and tsunamis. The United States has offered various forms of humanitarian assistance to the nations of the Asia-Pacific for decades; however, it was not until after the end of the Cold War that United States Pacific Command (USPACOM) began to conduct large-scale HADR missions. Since 1989, the United States military has led the charge in nearly every major disaster in Southeast Asia. China is geographically the largest country in the Asia-Pacific region. It is also home to the world’s second largest economy and the world’s third most powerful military. As it expands its regional and global influence, it rattles the nerves of its neighbors. In recent years, many in the leadership in China have expressed desire for a bipolar world, with the United States controlling the West and China managing the East. However, there is a gap in how China perceives itself and how it projects itself. A greater presence on the world stage also demands a larger and more comprehensive responsibility toward global affairs. When arguing for China’s increased participation in disaster relief efforts, it should be stressed that the United States should not scale back its own capabilities in the Asia-Pacific. In addition to providing first-responder capabilities in times of crisis, the United States military also serves as a constant presence that encourages regional stability. Tensions in the region are arguably higher than they have been in decades, with skirmishes over territory occurring often and increasing in frequency. Preemptively, the United States positioned air and naval assets in and around the South China Sea long before China became a regional power. These assets, many of which have been in place since World War II, have been a fairly effective deterrent to regional conflicts. However, greater cooperation and shared responsibility for humanitarian assistance/disaster relief in the region would be to the benefit of all countries involved. An increased role by China would serve to benefit China, the United States, and its neighbors. Recent history has had no shortage of large-scale natural disasters in Southeast Asia. In December 2004, a tsunami ravaged the northwest coast of Sumatra, Indonesia, killing more than 275,000 people and leaving nearly 10 million homeless. It remains one of the most catastrophic natural disasters in modern history. Within two days, the United States military stood up Operation Unified Assistance to respond to the crisis. 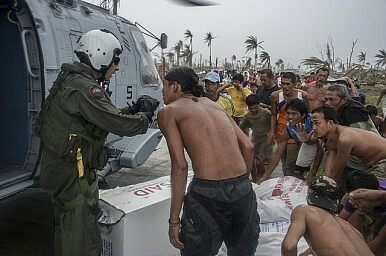 The U.S. government provided more than $950 million in aid and nearly 13,000 military personnel were devoted to the relief effort for nearly two months. In November 2013, Typhoon Haiyan struck the Philippines, resulting in nearly 7,000 casualties. It was the largest typhoon ever to hit the country. The United States responded in less than two days, deploying troops and delivering relief aid and supplies to affected areas. In addition to the more than $86 million in cash donated by the U.S. government, the military operation known as Damayan cost the United States more than $14 million dollars just in its first two weeks. The People’s Liberation Army (PLA) also has proven HADR capabilities. It has been actively engaged in domestic HADR efforts since its inception in 1949. In a country where flooding, drought and earthquakes have occurred with relative frequency for centuries, the PLA has become adept at reacting to these events. And in recent years the PLA has altered its doctrine with regards to HADR efforts, giving it an even larger priority in its mission. Historically viewed as a sideline task of the army, the PLA now classifies natural disasters as a non-traditional security threat. China’s overall military budget stands at approximately $115 billion a year (the conservative official government figure) and in March 2014, Premier Li Keqiang announced a 12.2 percent budget increase over the next year. The 2008 Sichuan earthquake provided the PLA its first opportunity to demonstrate its modern HADR capabilities to the world. The 7.9 magnitude earthquake which struck central China resulted in nearly 70,000 deaths and hundreds of billions of dollars in damages. The first government response team was deployed to the area within the first 14 minutes after the quake hit. Within a week, the PLA had deployed more than 100,000 troops to the affected area, equipped with helicopters, communication equipment, cranes and power generators. The rescue efforts were covered extensively on China Central Television (CCTV) and showcased a capable, quick-responding, and well-equipped military. During the Haiti earthquake crisis in 2010, the Chinese government was also quick to respond; donating millions of dollars in cash aid, in addition to providing a search-and-rescue team, medicines and medical staff and equipment, power generators, water purifiers, as well as tents and clothing. Just last month, President Xi Jiping pledged $16 million in humanitarian assistance for Syrian refugees in various countries, including Jordan and Lebanon. However, when Typhoon Haiyan hit in late 2013, the Chinese government faced international humiliation, as well as some domestic criticism, when it initially pledged only $100,000 in aid to the Philippines. After a bout of bad press, China finally increased its offer to $1.75 million and dispatched the hospital ship Peace Ark, but not until two weeks after the initial impact. This recent disaster in the Asia-Pacific highlighted not only China’s reluctance to help its neighbors, but prompted questions about its inability to stage a large-scale military HADR effort. While it is true that many Asian nations, as well as the United States, are often distrustful of China’s intentions, one needs only to look at how the United States’ own HADR efforts have served to repair World War II and Cold War wounds suffered by these many of these same Asian adversaries-turned-allies. Persuading China to take a more proactive role in Asia-Pacific HADR efforts would have several benefits for both the U.S. and China. Engaging in joint exercises does not pose a threat to national security, and China assuming more responsibility in this area would alleviate some of the financial and military burden overwhelmingly borne by the United States. It would allow the U.S. to free up assets that are needed elsewhere in the world. In times of disaster, the U.S. military typically deploys aircraft carriers, amphibious ships as well as other assets that must be reallocated from other places. Increased cooperation would also fortify joint cooperation and readiness, ensuring a more rapid and effective response for the next, inevitable disaster in the region. Increased joint cooperation would serve to benefit China as well. Increased cooperation can bolster its capacity to assist in, and eventually possibly lead HADR efforts in the Asia-Pacific region. There have been discussions about homeporting the hospital ship USS Mercy in Hawaii. This would allow for a more rapid deployment, but even then it would take a full week for the vessel to reach most disaster-affected areas in the Asia-Pacific. The Peace Ark has 300 beds, 20 ICUs, multiple operating rooms, and can accommodate dozens of major surgeries a day. Allowing China to assume a greater responsibility for humanitarian medical assistance buys time for U.S. assets to arrive, while immediately saving lives. This rapidly deployable presence could serve to ease tensions between China and other Asian states: partnerships can be nurtured through neighborly, humanitarian behavior. The U.S. regularly engages in bilateral military-to-military exercises with Asian partners, and supports the partners’ defense capabilities. These include PHILBEX and Balikatan in the Philippines, Cobra Gold in Thailand, and Keen Sword in Japan to name a few. One of the larger multi-lateral exercises, Cooperation Afloat Readiness and Training (CARAT), is an annual, multi-country exercise between the United States and Bangladesh, Brunei, Cambodia, Indonesia, Malaysia, Singapore, the Philippines, Thailand, and Timor-Leste. Continued bilateral and multi-lateral military engagement with partners in the region not only boosts the host-country capabilities to defend its own sovereignty, but also strengthens U.S. alliances creating channels for information sharing and increasing mutual trust. In the past, the United States has been reluctant to allow China to participate in joint exercises, but progress has been made in the last two years that seems to signal increased cooperation. In 2013, the United States and China engaged in successful maritime security cooperation in the Gulf of Aden. The counterpiracy exercises, held in the summer of 2013, comprised U.S. and Chinese destroyers, as well as helicopters and a Special Forces contingency from both sides. This successful cooperation helped to bolster subsequent joint exercises, including a two-day domestic HADR tabletop exercise hosted by the PLA in November 2013, and mostly recently, China’s first ever participation in the Rim of the Pacific Exercise (RIMPAC) in June 2014. Efforts should be strengthened to include China in other non-U.S. led regional exercises as well. Since 2009, the ASEAN Regional Forum (ARF) has conducted disaster relief exercises (DiRex). However, none of the countries in the region have either single or combined militaries capable of handling disasters like those in Indonesia or the Philippines. Still, the ARF DiRex has yet to include China. The United States has a voice within the ARF, and can encourage cooperation. Not only do regional exercises strengthen relationships between Asian neighbors, but displays of capabilities can work as a deterrent of future skirmishes and conflicts. The United States should encourage ASEAN nations to broaden the scope and the number of participants for these exercises to include China. China has become increasingly vocal about what it sees as its rightful place on the global stage. In June of 2014, Wu Xinbo, executive dean of Institute of International Studies with Fudan University was quoted as saying: “with the development of Asian economies, Asian countries have become confident and come to realize the importance of dealing with regional security by themselves. Therefore, it is logical that security in Asia should be determined by Asian countries.” With increased power comes increased responsibility: If China is truly to be a first-world power, it should be ready to shoulder a larger share of regional and global security responsibility, which includes regional humanitarian and disaster relief efforts. While there are voices on both sides that reject the notion of increased joint military cooperation of any kind, the positive second and third order effects of HADR cooperation outweigh the concerns. It is a fact that the Asia-Pacific region is perpetually impacted by large-scale natural disasters, and there is little debate that these disasters are expected to increase in frequency and scale as the global climate changes in the coming years. These disasters cost lives, and cost governments billions of dollars. Joint cooperation in the effort to save lives and restore infrastructure and government operations does not pose a threat to national security to the United States, to China, or to any other country in the region. HADR cannot and should not be a competition. The United States should encourage humanitarian cooperation among countries of the Asia-Pacific, not only to minimize the human toll from the impact of natural disasters, but to promote peace and regional stability. Jen Pearce is a PACOM Regional Analyst for the U.S government. The views expressed here are the author’s own. China-US Cooperation and the New Opium WarDonald Trump Won. Prepare For Uncharted Geopolitical Waters in AsiaAvoiding Groupthink on ChinaChina's Navy Is Already Challenging the US in AsiaCan the US and China Cooperate on Counterterrorism?